The rookie-level Appalachian League is the second-lowest rung of the seven levels in the St. Louis Cardinals minor league system in the United States. The St. Louis Cardinals’ entry in the league, located in Johnson City, Tennessee, generally featuring a mix of later draftees and promotees from the prior year Gulf Coast League, has been a regular in the post-season. That success includes four league titles in five playoff seasons in the eight years since 2010. In 2017, despite being in contention all summer, the defending champions fell just short of a wild card spot, finishing in a tie for second place in their division. That is the positive view. On the other hand, the Cardinals’ overall 33-34 record is their first losing season in over a decade. One has to go back to 2007 to find the last sub-.500 JC club. A seven-game losing skid to close the season cost Johnson City its wild card bid and hope of defending the league title. Still, the Cards came ever so close, finishing the season tied for second with Appy League West rival Greeneville, but losing out on the tie breaker. In the division, they were 7 ½ games back. As noted above, the 2017 edition of the Cardinals was unable to continue the regular-season success the club has enjoyed in recent years. Led by first-year manager Roberto Espinosa, the club played .493 baseball, winning 33 and losing 34. The Cards were barely a .500 club at home (18-16), but were not terribly worse on the road (15-18). The Cardinals finished the season tied for second place, 7.5 games behind the Elizabethton Twins in the West Division. Despite Greeneville losing its final three games, the Astros secured the second playoff spot on the head-to-head record tie breaker while the Cards finished on a seven-game losing skid. Despite both East Division playoff teams having a better regular season record, the E-Twins were hot at the right time and went on to claim their 11th title, second in league history to the Bluefield Blue Jays with 14. Ironically, 7.5 games was the exact same gap from the lead as the next level club down, the Gulf Coast League Cardinals, another 2016 league-winning team that also suffered a downturn of fortunes in 2017. 2017 was a major contrast from last season, when the Cardinals posted a .574 winning mark, going 10 games over .500 at 39-29 and winning the five-team division by 2.5 games. Going 4-1 in the post-season, the 2016 Cards went on to take the Appy League title. The Appalachian League is a short-season league. The 68-game regular-season schedule began on June 22 and concluded on August 31. The 10-team league is made up of two five-team divisions with the Cardinals in the West. Each club played 37 or 38 games within the division with the remaining 30 against the other division’s foes. The Cardinals got out of the gates well, winning all three June series and finishing 6-3 for the month. However, as the calendar flipped to July, the club hit tougher competition and lost their first five series. During that stretch, they suffered through a six-game losing skid during which the offense scored just 13 runs in total. Most of those losses were in games against key division rivals Elizabethton and Greeneville. All was not lost, however. After the 4-12 start to July, the Cardinals finished the month with a 9-5 run that included a four-game winning streak. At that point, JC was one game under .500 at 19-20. Play improved further in early August, as the Cards went 8-2, including a season-best six consecutive wins. On the 22nd, after going 4-3 against Elizabethton, JC was at 12-7 for the month and 32-27 on the season. A second-place finish and a playoff berth seemed quite attainable. Only three series remained, two of which were at home. Along with Greeneville, the other two sets were against East Division foes Princeton and Bluefield. The former was only playing for pride, but the latter was the league’s best team. When they needed to step up, instead the Cardinals fell flat. They won just one of those last nine games as the pitching crumbled and the offense did not have nearly enough firepower. Over that 1-8 finish, Johnson City was outscored by a whopping 67-25. Their seven-game losing skid to end the season was the longest by any team in the league in 2017. Even worse, by dropping that final series to Greeneville, the Cardinals lost the tiebreaker edge, which ultimately sealed their fate. The Cardinals organization has a long history in Johnson City, first affiliating with the local team in 1938. Other than two breaks totaling 15 years, St. Louis has provided players for the Johnson City club ever since. Including a pre-Cardinals title in 1921, Johnson City has 11 championships, won in the following years – 1921, 1940, 1945 (co-champs), 1958, 1964, 1975, 1976, 2010, 2011, 2014 and 2016. The 2012 club also made the post-season but lost in the division playoffs. Following are the JC Cardinals records by year since 2006. The recent run of success began in 2010. Though the average age of league pitchers is tightly bunched by teams, among the 10 clubs, the Cardinals pitchers were youngest at 20.3 years of age. That compares to the Appy average of 20.7. 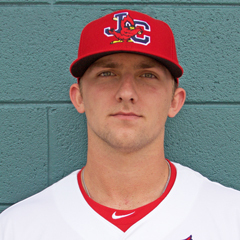 As an organization, the Cardinals are traditionally known for their pitching, but the recent results at Johnson City did not bear this out. Their 4.60 team ERA was seventh in the league and was a quarter of a run above the league average of 4.38. Even so, it was over a half-run better than the 2016 Cardinals staff, which finished eighth in the league in ERA at 5.19. The 2017 team WHIP of 1.49 was also seventh, again poorer than the league average of 1.42. The pitching staff, tutored by Cale Johnson, finished second in the league with 611 strikeouts, but the problems become more evident when considering the walk total of 271. That was the most in the league and over 100 more than the stingiest staff. From an age perspective, on the average, the Cards hitters were fourth-youngest of the 10 rosters at 20.0 years of age, slightly under the Appy League average of 20.3. Under first-year hitting coach Brandon Allen, the Cardinals offense was a just below the middle of the pack group in terms of numbers. The Cardinals were fourth in runs scored per game at 5.03, but that was much closer to the bottom six teams than the top three. Put another way, the Cards scored below about a quarter of a run per game under the league average of 5.26. The 2017 offense was seventh in the league in batting average at .249, sixth in on-base percentage at .334 and seventh in slugging at .383. Their .716 OPS was also sixth. In counting stats, the Cardinals were seventh in doubles with 114 and eighth overall with 11 three-base hits. However, they collectively swatted 55 home runs, good for third in the circuit. An ongoing shortfall across the entire system, including St. Louis, is baserunning. The Johnson City Cardinals are no exception. They stole just 42 bases, eighth in the league. However, they were not reckless. Specifically, their success rate of 66.7 percent was fourth-best, but still slightly below the league-average of 67.0. The 2017 Cardinals placed in the middle of the league defensively. Their fielding percentage of .965 ranked them fifth, and slightly above the league average of .963. Every position player except All-Star outfielder Chase Pinder committed at least one miscue, but third baseman Brady Whelan was the only one in double digits, with 16. The catching, led by Julio Rodriguez and Alexis Wilson, was a strength. The backstops allowed 13 passed balls during the 2017 season, third-fewest in the league. The catchers also threw out 41 percent of baserunners attempting to steal, 28 of 68, third-best rate in the league. The 33 players on the initial roster included four returnees from last season, 17 players up from the Gulf Coast League, seven from the Dominican Summer League and seven members of the 2017 Draft class. The latter group included five pitchers, lefties Brett Seeburger (10th round) and 13th rounder Jacob Patterson plus right-handers Jake Walsh (16), Evan Guillory (23) and Thomas St. Clair (24). Position player draftees were infielders Irving Lopez (19) and Wood Myers (29). 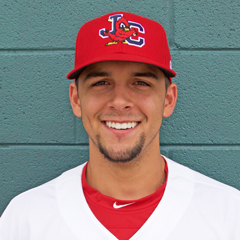 The youngest pitcher on the staff was 18-year old Alvaro Seijas, who was The Cardinal Nation’s 2016 GCL Cards Pitcher of the Year. Paired with him at the top of the rotation was 6-foot-6 Cuban Johan Oviedo, who made a strong debut in the DSL in 2016 after signing for a $1.9 million last July 2nd. 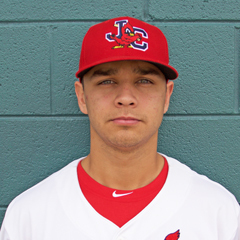 Youngest among all the JC-Cards was St. Louis’ first-round draft pick from 2016, shortstop Delvin Perez. The Puerto Rican native, who will not turn 19 until Thanksgiving, had a rough season. Struggling with the bat, Perez was sent down to the GCL for several weeks in July and shortly after his return, suffered a season-ending injury. 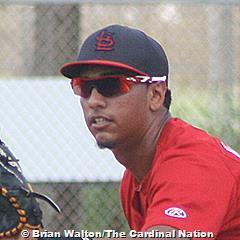 Rodriguez played at 20 years of age and the catcher was the only position player to skip over the GCL this year. 19-year old center fielder Wadye Ynfante had an all-star campaign in the 2015 Dominican Summer League. 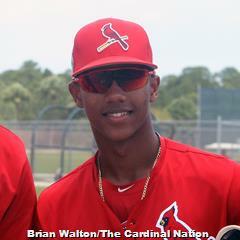 Other teens on the roster were pitchers Fabian Blanco and Edwar Ramirez, infielders Starlin Balbuena, J.D. Murders and Brady Whelan and outfielder Walker Robbins, all of whom played at 19 years of age this season. Among those joining the club during the schedule were trade acquisition infielders Imeldo Diaz and Stanley Espinal and independent league pitcher Zac Prendergast. The latter slipped into the rotation and performed well. Among the in-season promotions to State College were Myers (batting .410 through 19 games) and Oviedo (4.88 ERA over six starts). The 2017 Cardinals featured two .300 hitters – Pinder at .320 and Luis Bandes at .301, with two others close – Ynfante at .299 and Diaz at .296. Bandes was the key run producer, with team-bests in home runs (10), RBI (49) and slugging (.520). In the latter category, the strong runner up was Ynfante at .499. Julio Rodriguez led the club in doubles (14). Pinder’s .880 was the Cards’ top OPS. Ynfante’s 11 steals in 14 attempts made him the clear team leader on the bases, a total that placed him in a tie with two others for sixth in the league. Lopez topped the Cards with 37 runs scored. Among league leaders, Bandes was tied with four others for third in home runs and tied for the top in RBI across the circuit. He was fourth in slugging, with Ynfante seventh. Pinder was second in OBP and eighth in batting average, with Bandes and Ynfante 11th and 12th, respectively, in the latter category. In OPS, the three finished eighth through 10th in the order listed just preceding. The rotation had a tough go, as four made a double digit number of starts each. ERAs ranged from Jacob Schlesener at 4.33 to Seijas at 4.97 to Edwar Ramirez at 7.39 to Franyel Casadilla at 8.97. Only Seijas at 4-3 managed to forge a winning record. Two others joined later, making six effective starts each – Evan Guillory (1.17) and Prendergast (2.20). In total strikeouts, Seijas led the league with 63. Schlesener was third with 61, however, the latter also holds the dubious honor of walking the most batters, 38, six more than any other Appy League hurler. Ramirez’ seven losses were second-most with Casadilla in a group just behind at six. Jacob Patterson was the primary closer, with nine saves, second-most in the league. He was followed by Fabian Blanco with five and Thomas St. Clair with four. Top strikeout rate pitchers included St. Clair, Patterson and Jake Walsh at 12.9, 12.7 and 12.4 Ks per nine innings, respectively. Stingiest with walks was Brett Seeburger at 1.0 BBs per nine, followed by Guillory at 1.4 and Prendergast 1.7. Leading the way in strikeout to walk ratio was Seeburger at 9.3, with Prendergast at 7.3. 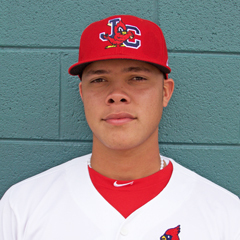 The Cardinals had three representatives named to the Appalachian League All-Star Team. For the fifth consecutive year, all Johnson City selections were position players – first baseman Bandes, second baseman Lopez and outfielder Pinder. In the evaluation of candidates for the top pitchers and position player on the 2017 JC Cardinals, we will drill down further into individual stats. As a team, the 2017 Johnson City Cardinals had below league-average pitching, slightly below average offense and slightly above average defense – yet managed to play above .500 ball until the final week and just missed a playoff berth. All considered, it was a drop in overall results from 2016. From the development perspective, as always, the club should provide a number of battle-tested players to higher-level organizational clubs in 2018. Link to master article with all 2017 award winners, team recaps and article schedules for the remainder of this series. 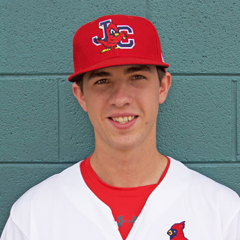 Of course, that includes our selections as the Johnson City Cardinals Reliever, Starting Pitcher and Player of the Year. Brian Walton can be reached via email at brian@thecardinalnationblog.com. Follow Brian on Twitter.